Remember not too long ago when I was debating the merits of buying versus leasing a new car? Well, as Murphy’s Law typically works, I got into a fender bender this past weekend. Fortunately I’m ok — I was hit from behind at a stop sign; the other guy admitted full responsibility to me and the police officer on the scene, so hopefully this won’t be too challenging to resolve. 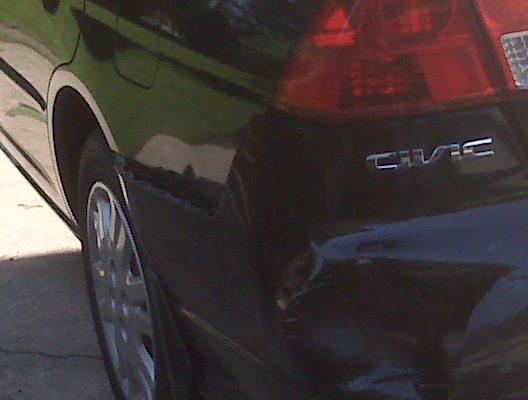 But it sure put a “dent” (haha) in my weekend, and my Civic’s tush is smushed!! I’ll be bringing it to the body shop later this week, so we’ll see what the damage is and how much of it the guy’s insurance will cover. I didn’t get to go outlet shopping as planned Sat. afternoon — but did get to see The Proposal with a friend — loved it! Needless to say, blogging just hasn’t been a top priority the past few days and so I had nothing prepared for today. It’s my lunch break now, and I just wanted to say hi and that I hope you all had a safe, happy and healthy weekend! Stay tuned for a review of You’d Be So Pretty If … tomorrow or Wednesday! Next postInside Out, Outside In? I’m sorry to read about the fender bender, but I’m glad you’re alright, Melissa! Things can always be worse. I try to remind myself of that when crappy things like this happen. Anyway, last time I was in a similar spot (it only happened to me 3 times), after being rear ended by another car,my neck started to hurt like hell – but only after a week. I went to see the doc and as it turned out it was from the damage the impact has caused. I’m not trying to scare you, I just want to stress that maybe visiting a physician wouldn’t be a bad idea. Oy vey…glad you’re not hurt and hope it all gets fixed soon! And thanks for the heads-up, WebDesign!